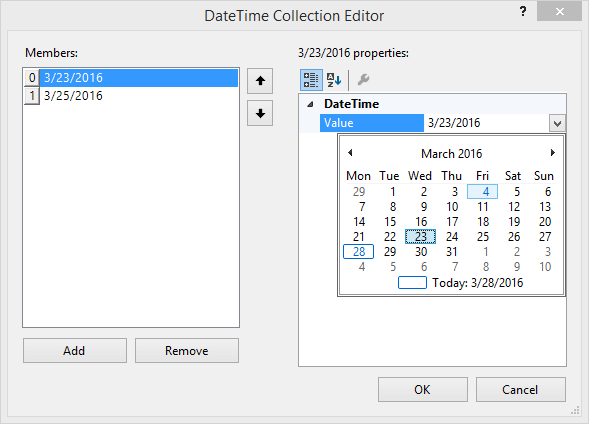 Click the ellipses in the Property Window to edit the SelecteDates DateTime collection at design-time. Use the Add button to add a DateTime value to the collection. To edit a given date, select it in the Members list and click the drop down list arrow for the DateTime Value property. Select from the calendar to assign the date. To remove a date select the date in the Members list and click the Remove button. Use the up and down arrow buttons to reorder the collection items. Click cancel to close the dialog without persisting your changes. Click the OK button to save your changes and close the dialog. If you close the DateTime Collection Editor, reopen and see that only the last date has persisted in the collection, verify that AllowMultipleSelect is set to true. If AllowMultipleSelect is false the expected behavior is that only the last date in the collection is used. Figure 1: Add selected dates.